I WILL ANSWER THEM ON OUR NEXT BLOG! 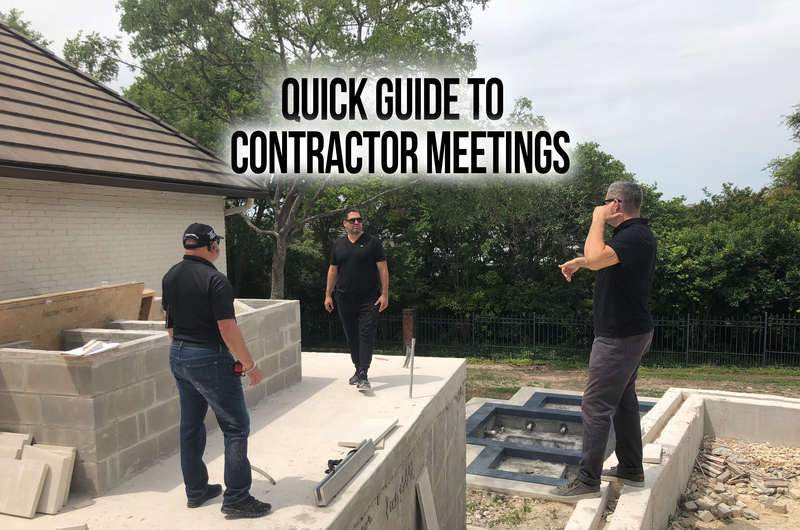 I wanted you guys to see exactly how a REAL LIFE contractors meeting is like! I’ve been working with these contractors and many others to get this project done, and done the right way! We are laying out this patio, that’s about $300k project. It’s very specific and requires a lot of attention to detail to get it done the RIGHT way. One of the specific task in this unique project is that we need to make sure that the patio has a specific float job that will allow the water to drain down the patio to avoid flooding or any other issues like it. Another task for this project is something that isn’t seen in San Antonio or even in Texas, but very common in the West Coast. We’re going to be putting glass around the patio to allow for a nice view. This task alone is a tough one because we’re having to coordinate with both the tile guy and our glass guy to make sure we’re all under the same page to make the project happen! We’re going to be meeting with the glass wall guy, the tile guy, and my property manager to make sure that these different trades are all on the same page. We do this to ensure a proper application on what we’re going to be doing, or else the screw up on a project like this could cost us over $10k. It’s very important to lay this meeting out so you can integrate all trades into one and how to negotiate disagreement between each other to fall on the same page. Watch the video above and LEAVE YOUR QUESTIONS BELOW!! !